St. George's Park ParkSt. George's Park in the centre of Great Yarmouth is a fabulous green area connecting town with seafront and the perfect place to relax. There are three entrances to the park, each marked with a different sculpture crafted by Norfolk Blacksmiths. 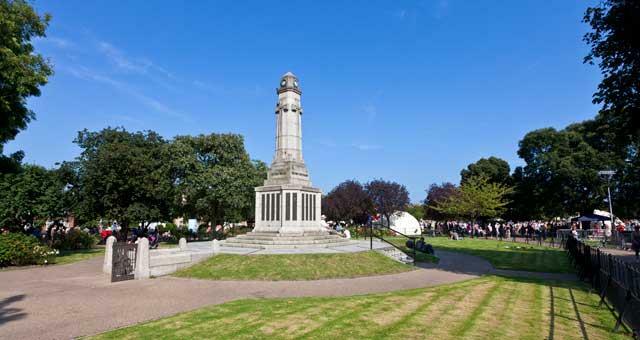 At the western end of the park, Great Yarmouth's war memorial is surrounded by lovely rose gardens and several park benches. A large green space, perfect for a kid's sunny day kick-about leads to the nautically themed children's play area at the eastern end, towards the seafront. 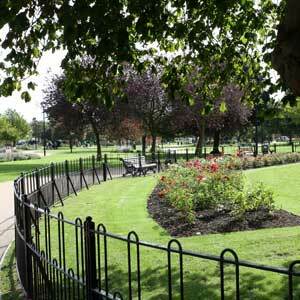 Plenty of park benches line the paved footpaths, with seasonal planting in flower all year round. The park is well lit at night and recycling bins and information boards with details about 'What’s On'’ locally can be found at the town centre and seafront entrances. The park features some beautiful local craftsmanship. A wooden carved sculpture of St George slaying the dragon was mastered by Mark Goldsworthy, a woodcarver from Bungay which can be found near the play area. Two Norfolk blacksmiths created the entrance features found at each of the gateways to the park. The herring arch over the town centre entrance at the north-west end was crafted by Nigel Barnett and features ropes intertwined with herrings, seaweed and star fish. Nigel also created the entrance feature opposite St George's Chapel at the south-west end which depicts mooring chains with seagulls perched aloft. The seagulls are the work of acclaimed Norwich sculptor, Ros Newman. Master Blacksmith Bill Cordaroy, from East Ruston created the third arch at the eastern seafront entrance of abstracted fishing nets and seaweed, reflecting styles from the nearby former Art School. St. George's Park in the centre of Great Yarmouth is a fabulous green area connecting town with seafront and the perfect place to relax. Well behaved dogs on leads are welcome, but please remember, there's no such thing as the dog-poo fairy!